Land Shark!! : Way to go Freddy!! 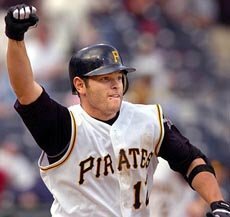 Congratulations to Freddy Sanchez for becoming the 2006 NL batting champion!! This story was one of the few bright spots in the season for the Pirates. I am so happy that Freddy was able to accomplish this after he was essentially relegated to the bench at the beginning of the year due to the acquisition of Joe Randa. Way to show them what you are made of Freddy!